ANY FAITHFUL CATHOLICS, including both laity and clergy, subscribe to the monthly publication, Magnificat. While its printed form may not be as noble as the bound volumes produced by the Benziger Brothers of old or the Midwest Theological Forum and Corpus Christi Watershed of today, my purpose in this post is not to comment on the disposability of some missal companions. In my estimation, Magnificat is a quality publication that serves an eager market. Among its many strengths, the publishers do a phenomenal job in the opening pages of introducing their readership to a new traditional chant every month—not an enterprise to be ignored in the larger project of sacred music renewal. The March 2014 edition of Magnificat includes a terrific series of short biographies, entitled, “Saints Who Were Artists.” Among those included are poets, painters, and musicians, ranging from well known to rather obscure. Following is a summary of each saint presented. As one of the Forty Martyrs of England & Wales, he is a favorite of Watershed’s. See a poem of his here. In the Paradiso, Dante place Peter Damian in the seventh heaven, home to those who contemplate the Word of God. A Jewish convert, Romanus is the writer of roughly one-thousand Kontakia, which are Byzantine liturgical hymns. A German Benedictine mystic, Hildegard wrote scholarly works, numerous musical compositions, and even a morality play. She was recently canonized and named a Doctor of the Church by Pope Benedict XVI. Catherine dabbled in writing, poetry, dancing, and Latin studies, but her forte was painting. She is a patron saint of painters and those who suffer from doubt. Presumably the author of both the Gospel of Luke and the Acts of the Apostles, Luke used words as well as colors to paint. A tradition from the sixth century holds that he painted portraits of the Blessed Mother, Peter, and Paul. Theodore founded a renowned monastic school of calligraphy. Perhaps even more significantly, though, he was the leading opponent of the “iconoclasts,” who sought to destroy images of Jesus, His Mother, and the saints. He was sent into exile for his defense of the use of holy images. After a career in the Roman Empire that culminated with his appointment as a Prefect, Sidonius became bishop of Auvergne in Gaul. He is the author of several panegyrics (poems of praise). John is the greatest of Spanish poets and the author of some of the finest Christian poetry ever written. It is said that Bl. John Paul II first studied Spanish specifically so that he could read John’s poetry in its original language. Declared in 1926 the “Mystical Doctor,” he is venerated as the national poet of Spain. Mute for the first seven years of his life, Andrew eventually became known for his strong preaching and beautiful hymns. He is the originator of the kanon, a new form of hymnody in the Greek liturgy. One of the world’s most widely beloved saints, the Little Flower was also a true artist. She wrote lovely poems and penned several plays, which the nuns called “pious recreations.” Therese was also an actress, producing and starring in all but one of her plays. Francis was a most devoted letter writer. It is said that he wrote 20 to 30 letters a day in his later years. His famous Introduction to the Devout Life began as a compilation of correspondence with Madame de Chamoisy. He is, understandably, the patron saint of writers. A very accomplished scholar, Dunstan was also a well trained artisan. He was a master of metal work, embroidery, and harp playing. A man filled with infectious joy, Philip has been credited not only with founding the Oratory, but also with crafting the genre of the oratorio. 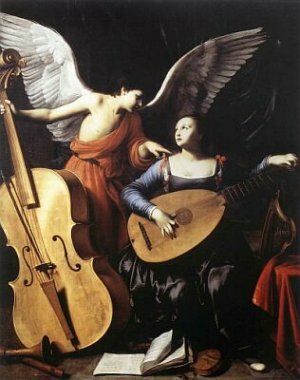 The patron saint of musicians, Cecilia is a virgin martyr of the early Church. The Acts of her life tell of Cecilia’s song, which was the plaintive, sweet cry of a heart entirely devoted to the Lord. Venantius is the composer of two of the most august hymns of the Church: Vexilla Regis Prodeunt, originally a celebration of the reception of a relic of the True Cross, and Pange Lingua Gloriosi Proelium, which later inspired the great Corpus Christi hymn of St. Thomas Aquinas. Surrounded by a family and circle of friends full of saints, the young Gregory preferred solitude. Chosen to be a bishop, the administration of his diocese and other priestly duties drew him away from the quiet he loved and into the heart of life in Constantinople. After resigning and returning to contemplative life, Gregory authored a series of poems, most notably De Vita Sua. We know through his contemporaries, St. Paulinus of Nola and St. Jerome, that Nicetas was an accomplished poet. In recent years, numerous scholars have proposed that Nicetas may be the author of the Te Deum. He shares a feast day, on June 22nd, with his friend, Paulinus.